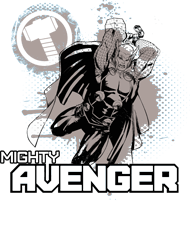 Thor Logo half sleeve T-Shirt, available in different colors, softest, smoothest, good looking regul..
Thor Mighty Avenger half sleeve T-Shirt, available in different colors, softest, smoothest, good loo..
Thor Mighty Avenger Running half sleeve T-Shirt, available in different colors, softest, smoothest, .. 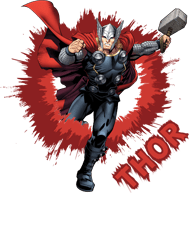 In the Ultimate Marvel Universe, Thor (Thorleif Golmen) is a fictional superhero based on the Marvel Universe version of Thor. Thor t-shirts are available with versatile sober look for boys & kids. Thor t-shirts are the most favourable casual comfort fit for their wardrobe costumes. Boys like to wear Thor t-shirts for regular and casual comfort fit. Thor t-shirts are looking nice with an appropriate stylish trendy look. Thor t-shirts are much comfortable for boys while they are wearing in free time & outdoor activities. If you are looking for Thor t-shirts as for your boys & kids. Thus, Neevov offers an amazing collection of Thor t-shirts in India. This is an more benefit for boys, they can be worn their favourite superhero t-shirts and can fulfil their desires. Thor t-shirts are the ultimate choice, come at the right place at Neevov.com and choose your selected item that suits to your boy's outfit. Thor t-shirts are an attractive look casual comfort and sweat absorb-able during the summer season. You can dress your own favourite superhero dress code and feel to get connect with them. 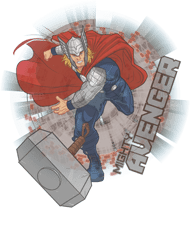 There is also a selection of varied featuring related to your favourite superheroes, like what they would like to wear and how to look with this smart casual look.Thor t-shirts apparel range has a huge selection of sizes, colours, and styles for boys & kids. Boys get extreme fun than any other way when they dressed up their favourite superhero dresses. Boys & kids enjoy such funny moments as their best memorable moments. 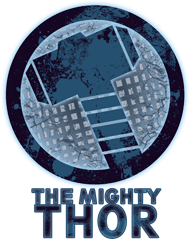 Thor t-shirts online are the apparel series that is designed to be extra durable but easy to wash through the liquid as well normal detergent, so you can get feel the same feeling what your hero feels at the moment. It is so pleasant moment for boys & kids if they wear different types of sober look Thor t-shirts. Thor t-shirts are printed with different multi colour print and some are printed with text but both provides a creative look to the boys & kids. The inspired designs are available for boys such as sleeve & full sleeve styles. Boys love to keep an extensive collection of the favourite superhero t-shirts into their wardrobe. Boys & kids consider their favourite superhero as their role model to inspire themselves. Choose your selected item for Thor t-shirts with the high-quality fabric. Printed t shirt India and plain t shirts for men good collection to summer season. 100% ring-spun combed cotton, Single Jersey, Good quality fabric Pre-Shrunk & Bio-Washed Fabric, Regular & Comfort Fit, Side Stitched For Perfect Fitting. Suitable durability.